Home / COUTURE OVERDOSE- JOIN US! There are few things as glitzy and glamorous as NYFW so no better time for Juicy Couture to launch their newest perfume Viva la Juicy Gold Couture. And we’re excited to be a part of the launch event at Gold Bar in NYC Tuesday night! 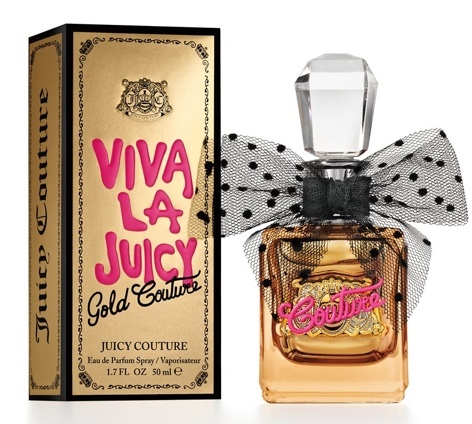 Viva la Juicy Gold Couture is for a girl that is couture all the way. She’s glamorous and decadent and the center of her golden world, For her, all that glitters is gold. Gold Couture is a decadent rendition of Viva la Juicy that indulges the senses with luscious wild berries, a kiss of honeysuckle and a luxurious elixir of golden amber, melted caramel, and vanilla. The Couture Overdose event will be an over-the-top gold and glitter experience to celebrate the launch of the perfume. From the decorations to the food to the spritz bar and swag, everything will be gold, glitz, and glam. We hope you’ll join us! !